This spring, though, I was ready for them, eagerly awaiting the tender, artful pea shoots, like edible curlicues, and the Sweet English shelling peas that immediately follow. A member of the legume family, English peas, also known as sweet peas and common garden peas, are best when super-fresh. The moment they’re picked, these sweet spheres start converting their tempting sugars into starch, and it’s the starchy peas that have vexed American children for the last 50 years, pushing them to hide them under mashed potatoes or roll them off plates out of gustatory boredom. The key to choosing delicious peas is to find ones that have just been picked, and what better place to do that than your local farmers’ market? 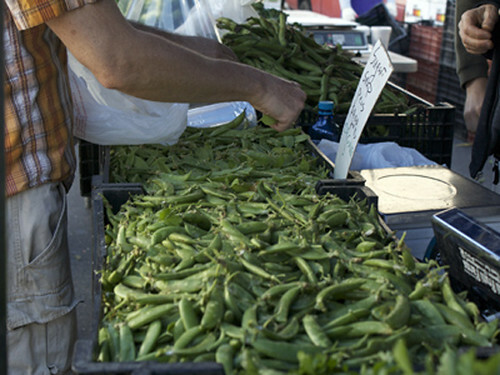 At the Hollywood Farmers’ Market the best peas I’ve found are from McGrath Family Farms (Camarillo) and Tutti Frutti (Lompoc). For the tastiest peas, select pods that are plump and bright green with tight-skinned peas inside (crack one open and take a look and taste, you’ll get the idea quickly). This year, many of them have pale speckles on the pods—these are from frost—but they shouldn’t affect the flavor. I find shelling peas meditative and love sitting in the sun snapping the pods open and listening as the peas roll into a stainless steel bowl. It’s a great job for kids, too, if you’re trying to get them into cooking. 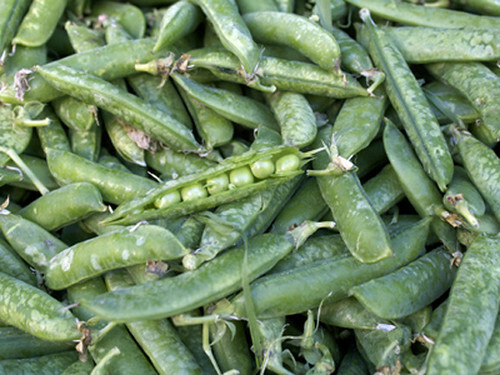 But if shelling peas isn’t your jam, try sugar snap peas. A cross between the English pea and a Chinese snow pea, these crisp, sweet treats can be eaten pod and all, and they require no cooking (actually, I strongly discourage cooking them). Both kinds of pea pair deliciously with herbs, especially mint and basil, which elevate their flavors and pretty up the plate. Pea shoots add a fresh, springy, hint-of-pea flavor to salads, and are delicious on their own just quickly blanched and sautéed. However you serve them, just remember that good peas don’t need much adulteration, practice restraint when preparing them, and none when eating them. Learn more about green peas on Foodista, a cool cooking encyclopedia. I love fresh peas. Unfortunately half the time they never make it into the house and instead turn out to be snacks while I am slaving away in the garden. YUM! Peas! Peas! Peas! Peas! Peeeeeas! I love snacking on fresh sugar snap peas whole, they’re like candy. Great photographs! Makes me want to head out to one tomorrow and go pea crazy! Lovely post!Brings back memories of me and grandma shelling peas(and popping a few in my mouth).Hope you wont mind but I’d love to direct Foodista readers to your site, just add this little widget here and it’s all set to go, Thanks! There are so many different type of peas, which one is the most popular?